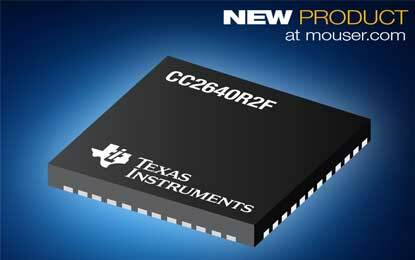 Texas Instruments introduced two new Ethernet physical layer (PHY) transceivers, expanding connectivity options for designers of both space-constrained applications and time-sensitive networks (TSNs). The DP83825I low-power 10-/100-Mbps Ethernet PHY has a 44 percent smaller package size than competing devices and provides a 150-meter cable reach. The DP83869HM is the industry’s only gigabit Ethernet PHY that supports copper and fiber media, and offers high-temperature operation up to 125°C, which enables engineers to leverage the speed and reliability of gigabit Ethernet connectivity in harsh environments. These devices join TI’s extensive portfolio of Ethernet PHY transceivers and empower designers to implement connectivity in a variety of challenging designs. The small package, low power consumption and long cable reach of the DP83825I enable designers to reduce the size and cost of compact IP network camera, lighting, electronic point-of-sale and other space-constrained applications without sacrificing network reach. The high operating temperature of the DP83869HM, as well as its electrostatic discharge (ESD) immunity and support for media conversion help increase performance and design flexibility in factory automation, motor drive and grid infrastructure equipment designs. Industry’s smallest Ethernet PHY: Featuring a 3-mm-by-3-mm quad flat no-lead (QFN) 24-pin package and a long cable reach, the DP83825I helps designers shrink system designs while increasing the physical span of their networks. The device’s extended cable reach eliminates the need for Ethernet repeaters, further reducing operating costs. Lowest Ethernet PHY power consumption: The DP83825I reduces thermal loading and power demands for Ethernet connectivity and enables the allocation of power to other critical components within a system by consuming less than 125 mW. The device also includes power-saving features such as energy-efficient Ethernet, wake-on-LAN and media access control isolation. 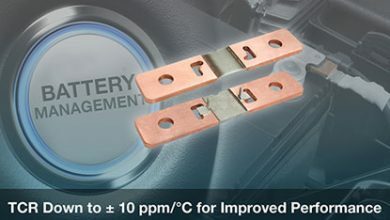 Industry’s widest temperature range and high ESD immunity: With a temperature rating of -40°C to 125°C for gigabit fiber operation and robust ESD immunity that exceeds the 8-kV International Electrotechnical Commission 61000-4-2 standard, the DP83869HM helps improve Ethernet system reliability in high-temperature and static-prone industrial environments such as factory floors. Design flexibility: The DP83869HM supports 1000Base-X and 100Base-FX Ethernet protocols and conversion between copper and fiber Ethernet standards, allowing designers to extend their long-distance networks. 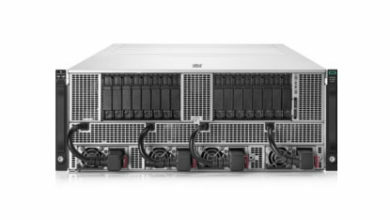 The device also features TSN support through low latency (<390 ns total) for both 1000Base-T and 100Base-TX standards. Engineers can jumpstart their designs with evaluation modules for the DP83825I and the DP83869HM. 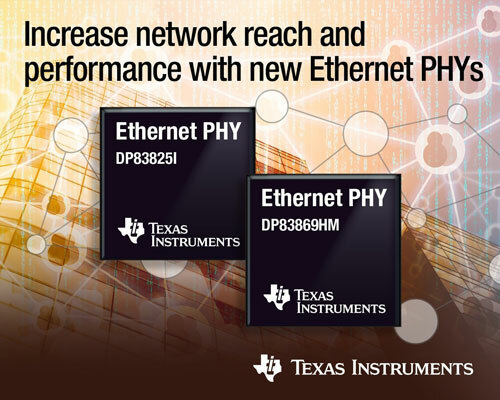 The DP83825I and DP83869HM expand TI’s portfolio of high-precision, low-latency Ethernet PHYs for industrial, automotive and general-purpose applications. Pre-production samples of the DP83825I are now available through the TI store in a 24-pin, 3-mm-by-3-mm QFN package. Pricing starts at US$0.71 in 1,000-unit quantities. Production quantities of the DP83869HM are now available through the TI store and authorized distributors in a 48-pin, 7-mm-by-7mm very thin QFN package. Pricing starts at US$7.13 in 1,000-unit quantities.